In unvaccinated humans, rabies is almost invariably fatal once full-blown symptoms have developed, but post-exposure vaccination can prevent symptoms from developing. The stereotypical image of an infected ("rabid") animal is a "mad dog" foaming at the mouth, but cats, ferrets, raccoons, skunks, fox, coyotes and bats also become rabid. Squirrels, chipmunks, other rodents and rabbits are very seldom infected, perhaps because they would not usually survive an attack by a rabid animal. Rabies may also be present in a so-called 'paralytic' form, rendering the infected animal unnaturally quiet and withdrawn. The virus is usually present in the saliva of a symptomatic rabid animal; the route of infection is nearly always by a bite. By causing the infected animal to be exceptionally aggressive, the virus ensures its transmission to the next host. Transmission has occurred via an aerosol through mucous membranes; transmission in this form may have happened in people exploring caves populated by rabid bats. Transmission from person to person is extremely rare, though it can happen through transplant surgery (see below for recent cases), or even more rarely through bites or kisses. After a typical human infection by animal bite, the virus directly or indirectly enters the peripheral nervous system. It then travels along the nerves towards the central nervous system. 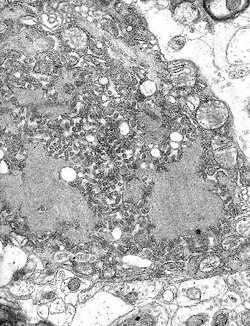 During this phase, the virus cannot be easily detected within the host, and vaccination may still confer cell-mediated immunity to pre-empt symptomatic rabies. Once the virus reaches the brain, it rapidly causes an encephalitis and symptoms appear. It may also inflame the spinal cord producing myelitis. The period between infection and the first flu-like symptoms is normally 3-12 weeks, but can be as long as two years. Soon after, the symptoms expand to cerebral dysfunction, anxiety, insomnia, confusion, agitation, abnormal behaviour, hallucinations, progressing to delirium. The production of large quantities of saliva and tears coupled with an inability to speak or swallow are typical during the later stages of the disease; this is known as "hydrophobia". Death almost invariably results 2-10 days after the first symptoms; the handful of people who are known to have survived the disease were all left with severe brain damage, with the recent exception of Jeanna Giese (see below). 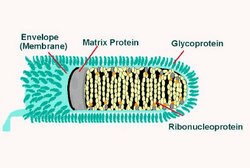 The Rabies virus is a Lyssavirus. 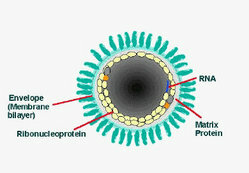 This genus of RNA viruses also includes the Aravan virus, Australian bat lyssavirus, Duvenhage virus, European bat lyssavirus 1, European bat lyssavirus 2, Irkut virus, Khujand virus, Lagos bat virus, Mokola virus and West Caucasian bat virus. Lyssaviruses have helical symmetry, so their infectious particles are approximately cylindrical in shape. This is typical of plant-infecting viruses; human-infecting viruses more commonly have cubic symmetry and take shapes approximating regular polyhedra. The number of dog-mediated rabies cases in China has increased exponentially; the number of human deaths has been high, primarily in poor, rural communities.